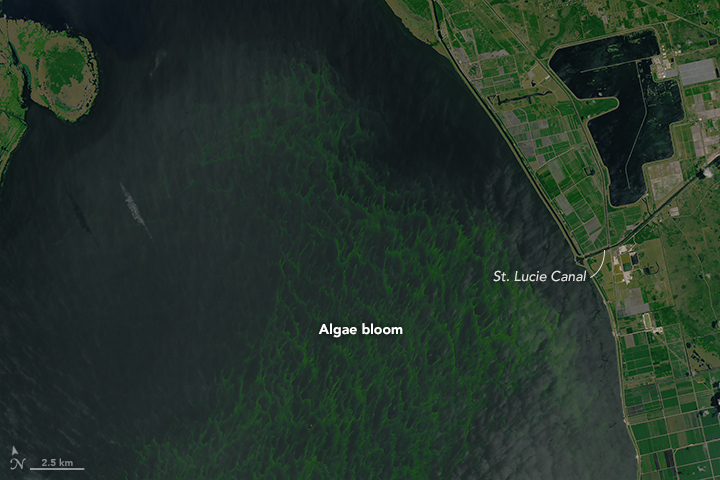 In early May 2016, an algae bloom on Florida’s Lake Okeechobee grew to cover 33 square miles. Nearby farm and residential runoff created conditions that caused the bloom in the lake and have been blamed for impacting water quality downstream to the Atlantic Ocean. Blue-green algae, also known as cyanobacteria often appears red in most of our aquariums when nutrient levels are too high but no matter the color it’s all cyanobacteria. Cyanobacteria reproduces rapidly when nutrients like phosphates and nitrogen are abundant in still and slower moving waterways. The bloom pictured here is believed to contain blue-green algae, as well as other types of phytoplankton but only water samples can confirm the exact composition of a bloom. 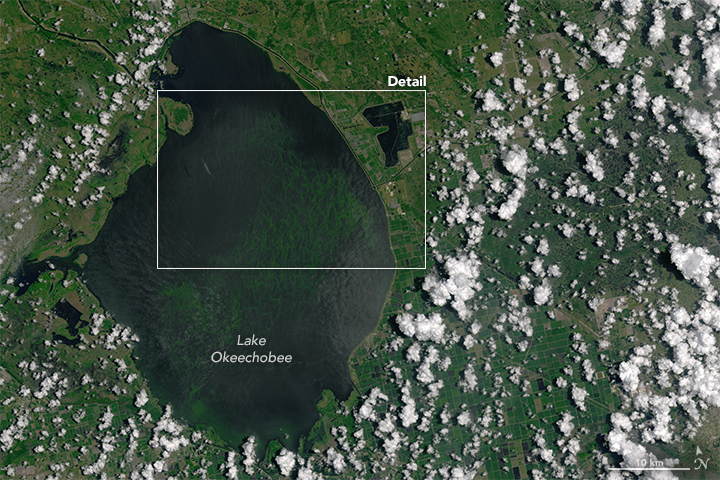 Algae blooms are a common occurrence in Lake Okeechobee during the summertime from pollution runoff from farms as lake water heats up throughout the summer months, creating an environment favorable for blooms to occur. However, this year, according to experts, the bloom grew large early in the season and it affected more residences, industry and tourism downstream than normal. Engineers began discharging water from the lake earlier in the year to address above average winter rainfall. The discharge flows through St. Lucie Canal on the lake’s eastern side and enters the Atlantic Ocean near Stuart, Florida. The river outflow carries nitrogen and phosphorous laden water from the lake as it’s diluted and freshened from some downstream sources that are typically too saline for much algae growth. As a result of the extra discharge from the lake, on June 29, Florida governor, Rick Scott declared a state of emergency in Martin and St. Lucie counties after the blooms appeared in local waterways. The algae and their toxins can disrupt ecosystems, affect wildlife and negatively impact tourism and fishing. The cyanobacteria blooms also pose health concerns for humans. Accidentally ingesting water containing cyanobacteria can cause nausea, vomiting and, in extreme cases, liver failure.